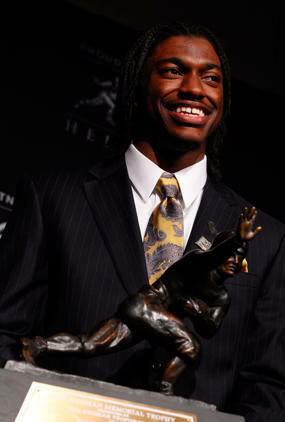 Baylor’s Robert Griffin III was named the 2011 Heisman Trophy winner saturday night. The Baylor quarterback became the first player in school history to win college football’s most prestigious award. In a spectacular season, Griffin passed for 3,170 yards and 35 touchdowns. He also had a 70% completion rate and 167.5 passing rating. Griffin III received 405 first place votes and 1,687 points to beat out Stanford’s Andrew Luck. Luck received 247 first place votes and 1,407 points. They were followed by Alabama’s Trent Richardson, Wisconsin’s Montee Ball, and LSU’s Tyrann Mathieu.